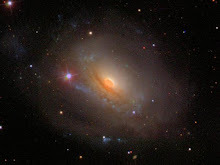 Alice in Galaxyland: Why do stars live in galaxies? Why do stars live in galaxies? 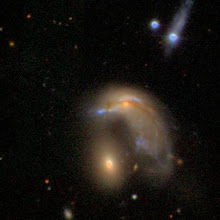 This post is dedicated to David Allen Green, who asked me after seeing my PubSci talk why the Universe is full of galaxies - stars living in "cities" - rather than stars being evenly spread around, so the Universe is one big galaxy. People often remark that the Big Bang sounds like an explosion, or is described as an explosion - and that is a violent, chaotic, destructive event, so why did it produce so much order? I have written about the Big Bang itself in more detail here. David knew this was not the case. His question is, in more scientific terms, this: if it produced so much order, and everything expanded - why did it expand with some areas being denser than others? I'm not going to answer in the traditional way a scientist would expect. I have a tendency to answer things by telling the story in the opposite order from the traditional way. Rather than starting with the Big Bang, I'm going to start with stars. The Big Bang did not emit stars. It did not even emit atoms. All this stuff came later - when things had cooled and been able to clump. Paradoxically, a star cannot form from hot gas, only cold, because the atoms (or molecules, or ionised atoms and electrons) of a hot gas or plasma are whizzing around too fast to be able to stick together and condense. So, how can gas cool down? There not being fridges readily available in outer space, it basically needs to be shielded from radiation. This happens in dust clouds. We can't see the centre of our own Milky Way Galaxy because of all the dust in the way. Longer wavelength radiation can get through a lot of it, but not optical (visible light). Where the dust or gas is thick enough, it can cool. And that's when it gets affected by gravity. It contracts. The nearest area to us where star formation like this is occurring now is in Orion's Belt. Next time you see the familiar hunter and those three stars lined up, you can relish the knowledge that although it looks dark around them, there's a churning gas cloud there and a great deal going on inside it - APOD has a gorgeous picture collection here. 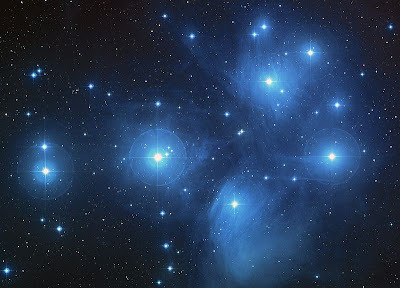 Star formation stops in the cluster once the stellar wind from the young stars blows off the rest of the gas; we know the Pleiades are young because there is still a lot of gas surrounding them. Due to the gravity of stars in their local neighbourhoods, these young clusters then tend to drift apart. While in Boston I heard one theory that we may have captured some of our comets and even planets from our sister stars in the Sun's infancy. It was an odd talk . . . Anyway - this was not the question, but I hope it demonstrates that star formation is not straightforward, and that things need to happen to get it going. I suppose one could say space needs to settle down and get ready. But why should there be clouds of gas in the first place? If the Big Bang sent everything out in its own direction, and the force of the explosion was equal, sending everything in a sphere (assuming there are three dimensions - in any case, sending equal quantities of everything in equal directions) - then everything should be the same space apart. Picture a given area of atoms, say of hydrogen. Each is the same weight and has the same gravity. Each is equally spaced from all the others. Each is pulling on the ones around it - so each feels a force from all of its neighbours in every direction. Like a tug of war whose sides are entirely evenly matched, nothing goes anywhere. But the Universe did not expand quite evenly. Its evenness - its homogeneity - is very, very nearly complete. Especially after inflation. When we look back at the time before any atom was cool enough to get near another, the differences were less than one part in ten thousand. That time is called "the dark ages" and it's the limit of how far back we can see. There's something in the way. And that's another sort of cloud - or to be exact, a plasma. A plasma is a seething mass of ionised atoms and their electrons - atoms whose electrons have been torn off. (There's probably no net electric charge, since for every negative electron zooming around, there's a positively charged atom somewhere.) The Sun is a plasma. And the one at the edge of the visible Universe is called the Cosmic Microwave Background. Space was so hot and dense then that whenever a photon of light went anywhere, it promptly collided with an atom or an electron and was sent off elsewhere. It would have been like looking through a thick cloud - or, indeed, the Sun itself, where the same thing happens. (This is why the light that shines down on us is millions of years old. It took that long to escape.) But once the Universe had cooled enough, electrons were able to bind with protons and neutrons, to form neutral atoms. At that point light could get through. We cannot look back any further than that boundary; we have to look at the rest of the Universe and work out what happened before that point. The COBE satellite, which launched in 1989, made a discovery about the Cosmic Microwave Background that explained our existence: some parts of it were hotter than others. Just a bit. And you've read earlier what hot particles do. They whizz around, they bounce off each other - they don't clump together as easily as cold ones. So everywhere in the Cosmic Microwave Background that was a tiny bit cooler got that tiny bit denser. And that's where gravity set in. That's where the clouds of hydrogen and helium started to fall together. I have yet to read an astronomy book that doesn't jokingly relate this to capitalism - that the rich get richer and the poor get poorer - in other words, any area with just a bit of density will, over time, attract more and more material. And, conversely, the empty areas get empty. Marcus Chown has written a whole book about how the Cosmic Microwave Background was discovered, and the tiny, tiny fluctuations in it - Afterglow of Creation. 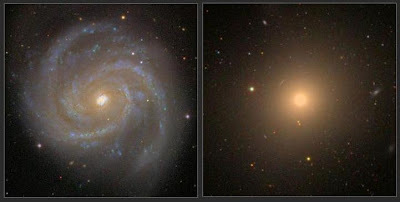 Stars and galaxies soon formed; the furthest - that is, the earliest we can find - you can read about here. 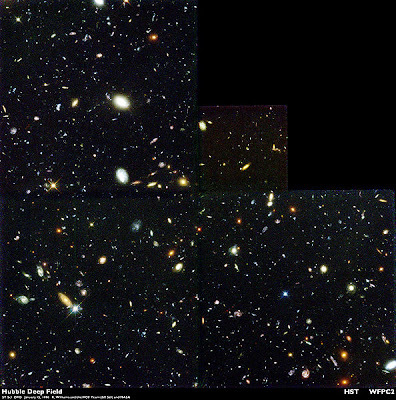 Look at the Hubble Deep Field, a region of space containing vast numbers of very early galaxies, and you'd think that all that uniformity you'd expect from the Big Bang hadn't happened at all. And yet . . . David was also not wrong. Not at all. Before writing this blog post, I dug out Horizons of Cosmology by Joseph Silk, which Astronomy Now had kindly sent me in exchange for a review, and which prompted this blog post. I thought it would probably remind me of a few useful things, and it did. 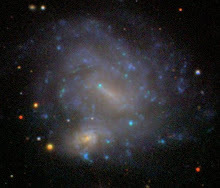 Galaxies live in clusters. Our own Milky Way does - and it is steadily zooming towards a larger cluster, even while the Milky Way and Andromeda circle each other, ready to merge. And clusters live in superclusters. 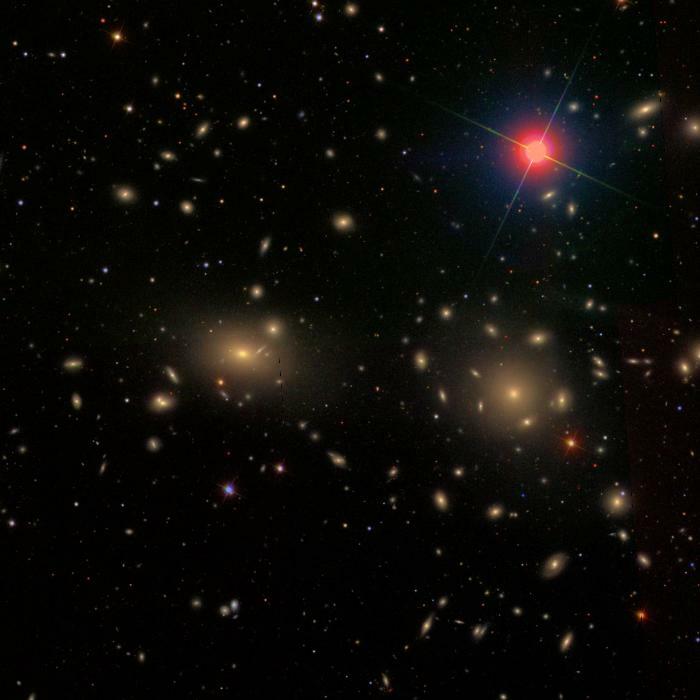 Superclusters are the largest objects in the Universe. 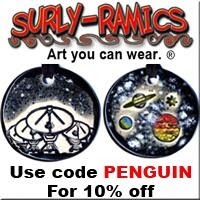 They are like bright filaments through the blackness of space. An accident and emergency doctor and dedicated galaxy classifier once remarked to me that they look remarkably like neurones in the brain. "The larger the region, the more the universe approaches homogeneity. 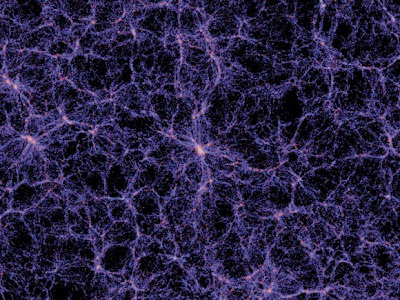 On average, the universe is completely homogenous. There is no dense centre, no rarified boundary region. Yet everywhere there are galaxies. In some regions, there are slightly more than the average, and in others, slightly fewer. We describe these variations as fluctuations in the average density of the Universe. Some are positive, some are negative. When we measure the strength of the density fluctuations, in other words, we find that the overdensity or underdensity is smaller with increasing scale . . ."
Float away from our world, and look down at it: it will seem huge. Further, and it will shrink, and so too will the Sun, melding into our local group of stars. 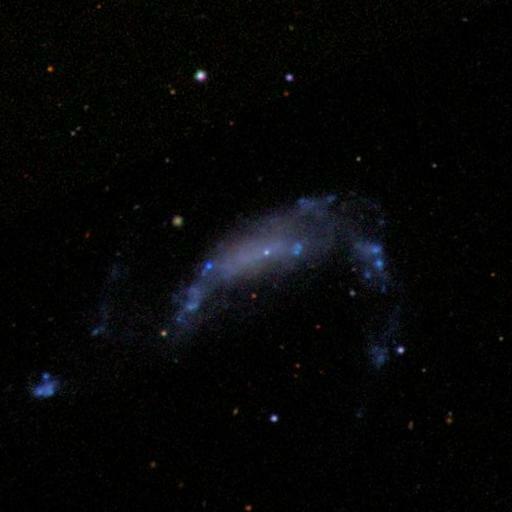 Later will come our Galaxy's spiral arm, then the galaxy itself. Then the cluster. Then strings of superclusters . . . the further you go, the more you see, the more similarity you will see. It's like when you break the world down to see atoms, and then electrons and quarks. Nature is simple. The Universe is vast. And I love it. Nice picture and very interesting article! I allowed this one through as, amazingly, it actually does lead to a post of basic "facts about Earth" (e.g. that the tides are caused by the Moon), though bizarrely we are warned to "ignore these facts at our own peril". I was expecting the usual "I love this post, look at my interesting link which leads to trashy jewellery or viagra adverts", which I delete. If you're reading this, I'm glad you liked my post and thank you for saying so. If you're just looking to get viewers onto your blog, my reaction is....lukewarm, shall we say - sorry.